You can no longer go without these number punches during any Arts & Crafts activity. They will literally turn any project into a real creative activity. 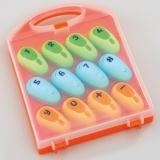 Includes numbers 0-9, including the plus and minus signs and comes packaged in a handy little suitcase. Very educational and fun at the same time. Can be used from 3 years old. Allocation: one set per 8 to 10 learners.